Uva Nera – Take it slow! 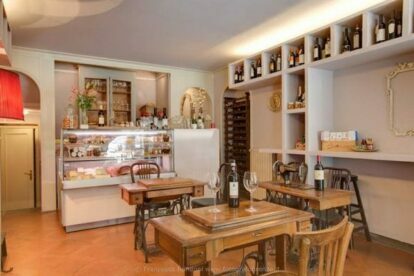 Uva Nera probably offers one of the best aperitivo in town! Is a lovely three-level place, furnished with a nice “shabby-Tuscan-vintage style” where every piece of furniture is actually for sale! Talking with Costanza (the owner) you can see how much passion she puts into choosing every bottle of wine and every ingredient you find on the counter! Everything is km0, organic, and just very very good. Sponsored by Slow Food it’s a classic place where you can have a real Italian experience, so, take it slow! Taste the local cheese and cold cuts, listen to the music, relax and have a nice bottle of biodynamic wine. And now, I think it’s high time for a confession… ready? I don’t really like wine! I know, I know, some of you are twitching your eyes, but some (maybe) agree with me that nothing’s better than a beer! And don’t worry, at Uva Nera there’s space even for us heretics! A nice selection of artisanal beers is waiting to be discovered! And what about vegetarians? Well, luckily enough the Tuscan kitchen doesn’t leave anyone with an empty stomach nor does Uva Nera! Every Thursday it’s time for the “Aperibio” (organic aperitivo) with a vegetarian menu and a selection of wine made to match with it.